Westfield Transport (Depot 97) offers the many benefits of being a member of the Palletforce Distribution Network. This cutting edge technology gives our customers the greatest quality of delivery service possible as well as the flexibility to distribute small consignments as well as larger loads. We are very proud to be a member of the most prestigious pallet network in the country. We are a member of a Pallet Network which utilises a shared delivery system. 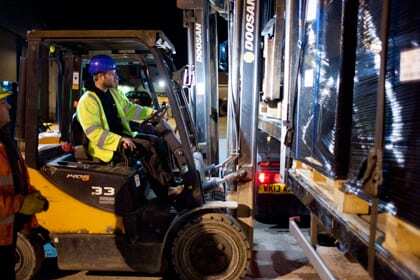 We collect goods from a main distribution point in the Centre of England in the early hours of every morning. The £30 million purpose built “Hub” utilises a massive 400,000 Square feet for its nationwide members. As this shared delivery system enables economies of scale, clients are able to save costs as well as helping the environment on a daily basis. Goods will be received by the customer the next day and if pre-arranged; no later than 10AM. By being able to offer small, regular deliveries; customers can reduce inventory, reduce lead times, as well as; improving cash flow and cost control. By setting up a central distribution hub and working together; each freight company can deliver and collect any goods from other hauliers before returning back to their county to distribute. 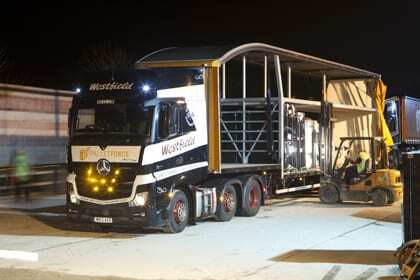 Out of over 100 strategically placed depots throughout the u.k, westfield transport boasts palletforce member service committee award winner 2011 and more importantly, the 2012 depot of the year award.